Francisco Nunez & the Young People's Chorus of NYC Stephanie Berger Photography. 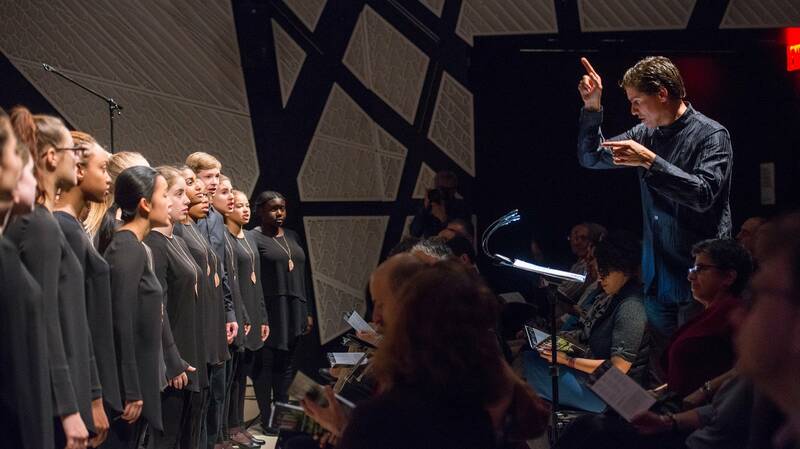 Francisco J. Nunez, a MacArthur Fellow and Musical America's 2018 Educator of the Year, is a composer, conductor, visionary, leading figure in music education, and the artistic director/founder of the Young People's Chorus of New York City (YPC). Since he founded YPC in 1988, Mr. Nunez has heightened an awareness of the ability of children to rise to unforeseen levels of artistry. He is sought after nationwide as a guest conductor by professional orchestras and choirs, as a master teacher, and a frequent keynote speaker as a leading authority on the role of music in achieving equality and diversity for children in today's society. Mr. Nunez composes countless compositions and arrangements in all musical formats and styles for choirs, orchestras, and solo instruments and has received an ASCAP Victor Herbert Award, the New York Choral Society's Choral Excellence Award, and Bang on a Can's Visionary Award. Musical America Worldwide named him among 30 "Influencers" for his contributions to the music industry, NYU Steinhardt honored him with its Distinguished Alumnus Achievement Award; and he holds Honorary Doctor of Music degrees from both Ithaca College and Gettysburg College.